This article is about a public telephone. For the song by Maroon 5, see Payphone (song). A payphone (alternative spelling: pay phone) is typically a coin-operated public telephone, often located in a telephone booth or in high-traffic outdoor areas, with pre-payment by inserting money (usually coins) or by billing a credit or debit card, or a telephone card. Prepaid calling cards also facilitate establishing a call by first calling the provided toll-free telephone number, entering the card account number and PIN, then the desired connection telephone number. An equipment usage fee may be charged as additional units, minutes or tariff fee to the collect/third-party, debit, credit, telephone or prepaid calling card when used at payphones. By agreement with the landlord, either the phone company pays rent for the location and keeps the revenue, or the landlord pays rent for the phone and shares the revenue. Payphones are often found in public places to contribute to the notion of universal access to basic communication services. One thesis, written as early as 2003, recognised this as a digital divide problem. In the 20th century, payphones in some countries, such as Spain, used token coins, available for sale at a local retailer, to activate pay phones, instead of legal tender coins. In some cases these have been upgraded to use magnetic cards or credit card readers. In the past, payphones were ubiquitous around the world, but their prevalence has decreased significantly over the years due to the increasing availability of mobile phones, but cell phone service is not always available in emergencies. Most payphones in Canada are owned and operated by large telecom providers such as Bell, Telus and SaskTel. In the last 20 years customer-owned coin-operated telephones (COCOT) have also appeared in the market, but their numbers are smaller due to emergence of mobile phones. The cost of most local payphone calls is 50 cents CAD, having increased from 25 cents since 2007. Pay phones in Alberta were 35 cents for a time, but in most jurisdictions the price simply doubled. Newer phones allow users to use calling cards and credit cards. For coin-paid long distance, COCOTs are less expensive for short calls (typically $1 for three minutes) than incumbent providers (whose rates start near $5 for the first minute). Dialing 0 for operator and 911 calls are still free. The Toronto Transit Commission deploys payphones on all subway platforms as a safety precaution; a blue "Crisis Link" button on 141 payphones connects directly with Distress Centres of Canada as a free suicide prevention measure. As of 2013, there were about 70,000 payphones across the country. In 2013, the CRTC issued a temporary moratorium on the removal of payphones in small communities. In September 2015, the CRTC remarked that "32 per cent of Canadians used a payphone at least once in the past year," and that they are used "as a last resort in times of inconvenience and emergency." The payphone model 23, introduced at Deutsche Bundespost Telekom in 1992, is an electronic software controlled payphone for analog connections. It is equipped with coin, (German: Münzspeicherwagen), and integrated test program setting. It has a remote maintenance, the independent reports of a background system by means of an integrated modem error (for example, defects in components, lack of listeners), operating states (for example, full coin box) or departures (for example standing open the cartridge mounting door, missing coin) to the all public pay telephones of Deutsche Telekom AG are turned on. The Payphone 23 consists of two basic units, the equipment part including all the necessary for the operation modules (BG) and the secured below the growing payphone cassettes with the coin box. In Italy public payphones have been installed and maintained over the years by Telecom Italia (formerly SIP). Payphone model U+I from 1964 to 1982. Payphone model G+M from 1982 to 1987. Payphone model Rotor from 1987 to 2002. Payphone model Digito since 2002. 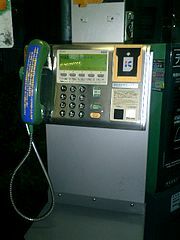 The majority of payphones on the street and in buildings in Japan are installed and maintained by Nippon Telegraph and Telephone (NTT). In the Soviet period different types of payphones were produced. 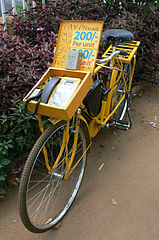 There were also long-distance call payphones costing 15 kopeks, and also provided services of paid media such as listening to an anecdote, obtaining legal advice, or finding the address of the subscriber by phone number. After the collapse of the Soviet Union and the monetary reform of 1991, this form of payment became irrelevant. Some payphones were altered to accept tokens, while others have been designed to use telephone cards. For example, in St Petersburg, payment for payphones can be made with metro tokens. In some regions, calls from public phones are free of charge. Telephones were a monopoly of the national government. Pay phones took a slug or ficha, a piece of metal with two troughs in it, making it hard to counterfeit. Payphones were typically found in bars, restaurants, and stores, never freestanding. Phones would accept some 5 fichas at a time (the exact number varied depending on phone model), showing through a plastic window the number remaining, and return unused ones to the customer. An older and simpler system was to use a mechanical counter, which automatically counted units of time, called pasos, a "pass" in the sense of "passage of time". The counter was the marcador de pasos. The length of each paso varied depending on the cost (distance) of the call. At the conclusion of a call the number of pasos was multiplied by a fixed amount, which could vary by time of day, creating a sum total that the customer would pay to a human attendant. These survived in small hotels at least until the 1970s. Spain also had an institution with no equivalent in the United States, the locutorio, literally "place where one talks". They were a type of store, in the main square of a town or close to it, where one booked a phone call by going to a counter, filling out a paper slip, and handing it to a human (almost always a female). Sometimes advance payment was required (unused minutes refunded). The recipient of the slip would either directly or indirectly, depending on the equipment, make the call and send the customer to a phone booth with a dialless instrument on which to speak. In communities too small to support a locutorio this service might be offered by businesses with telephones, such as pharmacies. Locutorios disappeared in the last quarter of the 20th century, as the whole country moved to direct distance dialing and cell phones (in Spanish "mobile phones") grew. In the UK payphones have been deregulated. The great majority of them are still operated by British Telecom but there are other providers, mostly in urban areas. Hull, Manchester, London, Cardiff and Glasgow at the turn of the 21st century have a greater concentration of non-BT payphones. Since BT has been removing payphones which are unprofitable, have few or no calls made in a financial year. BT allows local communities to adopt the iconic Red K6 Kiosks due to strong opposition to their removal from the communities that the kiosks reside in. This will mean the removal of the phone, leaving the empty kiosk in-situ. Another option BT has provided is the sponsored kiosk, that will retain the phone service, and retain the kiosk for an annual fee of around £300 +VAT, whether it is the Red K6 or the newer aluminium and glass kiosks that cannot be adopted. Due to disability discrimination law, in the past payphone providers were required to provide a certain number of textphone payphones as part of their network, as this was deemed a 'reasonable adjustment' for deaf customers. These phones can also make voice calls, as well as send SMS and e-mail messages, and although this requirement is no longer in force due to minimal use of the textphone feature in these phones, many of the these devices remain in service, generally in populated areas. In addition, in the early 2000s BT installed a large number of 'Multiphones' that provided internet access, on top of voice, SMS, and e-mail functionality. These payphones provided these services through the use of a 2-channel ISDN2 connection, a QNX-based operating system, and a touchscreen interface to allow the user to browse websites and receive e-mail messages on a pay-per-minute basis. However, these devices have since been removed due to quickly becoming obsolete, often with the ordinary payphone previously installed in that location taking its place once again. From 1 June 2010, BT payphones have £0.60 minimum charge which is for first 30 minutes of any direct dialled national geographic call. Previously the minimum charge was £0.40 for the first 20 minutes of any direct dialled national geographic call. Then before November 2006 the minimum charge was £0.30, before 2004 it was £0.20 and before 2000 it was £0.10. Credit/debit cards can also be used, and many BT payphones have card readers for this service, however calls made using a card are charged at a significantly higher rate than calls made using cash. BT Phonecards were introduced in 1981 and could be used in most BT payphones to pay for calls. Purchased from participating retailers, and originally using an optical system to register credit, the design was changed to a chip-based system in the 1990s, before being withdrawn altogether in 2003. In the past, a BT Chargecard could be used from any UK landline to charge any telephone calls made to the cardholder's BT home telephone account, at no cost to the owner of the landline the card was being used from. These were most commonly used in payphones, and some BT payphones have dedicated readers for these cards. However, this service has since been discontinued. Other cards which are often used instead include supermarket international calling cards and many other telephone cards which can be bought from newsagents. Although 0800 and 0808 numbers are free to the caller when dialled from most payphones, the owner of the number will be billed a 'Payphone Access Charge' (PAC) which has increased significantly in recent years, and is currently 79p per minute, if their number is called from a payphone. This has resulted in many businesses, and even calling card providers, barring calls to their freephone numbers originating from payphones. Charity helplines are exempt from this charge if called from a BT payphone, however this exemption does not apply to calls made from payphones owned by other providers, and in these cases the charity will still have to pay the PAC. There is a 40p connection charge, in addition to the "per minute" charges shown below, and a minimum charge of 60p. Some payphones also offer SMS and e-mail service, both of which are charged at 20p per message, and must be paid for using cash. Payphones were preceded by pay stations, manned by telephone company attendants who would collect rapid payment for calls placed. The Connecticut Telephone Co. reportedly had a payphone in their New Haven office beginning 1 June 1880; the fee was handed to an attendant. In 1889, a public telephone with a coin-pay mechanism was installed at the Hartford Bank in Hartford, Connecticut by the Southern New England Telephone Co. It was a "post-pay" machine; coins were inserted at the end of a conversation. The coin mechanism was invented by William Gray; he was issued a series of patents for his devices, beginning with US#454470 issued 23 June 1891 for a 'Signal Device for Telephone Pay-Stations' which rang a bell for each coin inserted. He subsequently founded the Telephone Pay Station Co. in 1891. The "pre-pay" phone debuted in Chicago in 1898. By 1902, there were 81,000 payphones in the United States. By 1905, the first outdoor payphones with booths were installed. By the end of 1925, 25,000 of these booths existed in New York City alone. In 1960, the Bell System installed its one millionth telephone booth. Booths, which were expensive, gradually faded away not much later. The Bell System pay phone took nickels (5¢), dimes (10¢), and quarters (25¢); a strip of metal along the top had holes the size of each coin. This made possible a mechanism causing each coin to make a different series of sounds as it fell into the cash box; thus an operator listening could tell how much had been inserted. On average, pay phone calls generally cost 5¢ into the 1950's and 10¢ until the mid 1980's. Rates standardized at 25¢ during the mid 1980's to early 1990's. The Bell System was required to apply for increases through state public service commissions. Therefore, the actual increases took effect at different times in different locations. After the breakup of the Bell System in 1984, it was not long before independent stores selling telephones opened up. After that, privately owned payphones hit the market. Sources differ as to whether the peak number of payphones in the United States was 2.6 million in 1995 or 2.2 million in 2000. Since 2007, the number of payphones in the United States in operation has declined by 48%. In July 2009, AT&T officially stopped supporting the Public Payphone service. Over 139,000 locations were sold in 2009. At the end of 2012, the FCC reported the number of payphones at 243,487 generating $362 million falling to $286 million by 2015. The major carriers, AT&T and Verizon, have both exited the business, leaving the market to be served by independent payphone companies. An estimated 100,000 payphones in the US remain as of 2018, with roughly a fifth of them located in New York. In recent years, deregulation in the United States has allowed payphone service provided by a variety of companies. 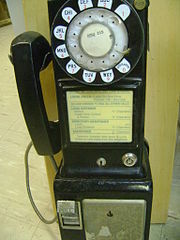 Such telephones are called "customer-owned coin-operated telephones" (COCOT), and are mostly kept in as good condition as compared with a payphone owned and operated by the local telephone company. COCOT contracts are usually more generous to the landlord than telco ones, hence telco payphones on private premises have been more often replaced than street phones. [further explanation needed] One common implementation is operated by vending machine companies and contains a hard-wired list of non-toll telephone exchanges to which it will complete calls. In the United States, a payphone operator collects an FCC-mandated fee of 49.4¢ from the owner of a toll-free number for each call successfully placed to that number from the payphone. This results in many toll-free numbers rejecting calls from payphones in an attempt to avoid this surcharge; calling cards, which require the caller to dial through a toll-free number, will often pass this surcharge back to the caller, either as a separate itemized charge, a 50¢ to 90¢ increase in the price of the call, or (in the case of many pre-paid calling cards) the deduction of an extra number of minutes from the balance of the pre-paid card. In the Superman comic books and live action films, Clark Kent routinely uses a phone booth to change into his Superman costume. Similarly, Underdog also changes into his costume from a shoe-shine vendor using a phone booth, however, with total demolition of the booth and phone set. A pay phone booth was used as a time machine in the 1989 film Bill and Ted's Excellent Adventure. 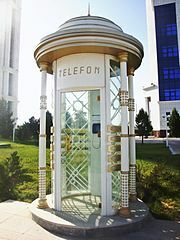 The 2002 film Phone Booth takes place in a phone booth. The main character is held hostage in it for a whole day. He has been using the payphone to call his mistress so that his wife will not see the telephone number on their cellular telephone bill. A Mojave phone booth in an isolated area of the Mojave National Preserve miles from the paved road was the subject of an Internet meme and a 2006 independent film, Mojave Phone Booth. The original Pacific Bell booth was removed in 2000; for nostalgia, Lucky225 assigned its number (1-760-733-9969) to an open conference bridge in 2013. Payphone in China with a web browser built-in. Toronto payphones covered with graffiti and notices. ^ Hasbi, Maude (1 September 2014). 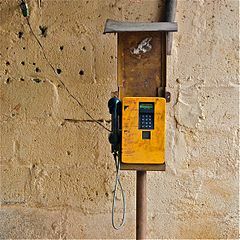 "Universal Service Obligations and Public Payphone Use: Is Regulation Still Necessary in the Era of Mobile Telephony?". doi:10.2139/ssrn.2499391. SSRN 2499391. ^ Hopper, Tristin (3 April 2012). "What the #!%*? Bell Canada looks to raise payphone rates 100%, again". National Post. Retrieved 5 May 2015. ^ Kalinowski, Tess (16 June 2011). "Woman's mental illness inspires TTC's suicide prevention program". Toronto Star. Retrieved 31 July 2016. ^ "Phone booths are down in Edmonton but not completely out". Edmonton Sun. 8 March 2014. Retrieved 23 December 2014. ^ "La storia, in breve, della cabina telefonica" [The history – in short – of the telephone booth] (in Italian). 21 June 2018. Retrieved 1 July 2018. ^ "Adopt a Kiosk | BT.com". Payphones.bt.com. Retrieved 31 July 2012. ^ "Adopt a Kiosk | BT.com". Payphones.bt.com. 12 April 2011. Retrieved 31 July 2012. ^ "Textphones - Hansard". hansard.parliament.uk. Retrieved 20 December 2018. ^ Day, Julia (25 July 2001). "BT in payphone boost". The Guardian. ISSN 0261-3077. Retrieved 20 December 2018. ^ a b Week, Marketing (17 August 2000). "BT unveils text payphone drive". Marketing Week. Retrieved 20 December 2018. ^ Nuttall, Chris (15 July 1999). "BBC News | Sci/Tech | Payphones go online". news.bbc.co.uk. Retrieved 20 December 2018. ^ "BT LAUNCHES MULTIPHONE - THE PHONE BOX OF THE FUTURE". ResponseSource Press Release Wire. 15 July 1999. Retrieved 20 December 2018. ^ Schofield, Jack (22 July 1999). "Dialling up the future". The Guardian. ISSN 0261-3077. Retrieved 20 December 2018. ^ Banbury, Louise (17 January 2001). "BT launches free public internet access". www.campaignlive.co.uk. Retrieved 20 December 2018. ^ "Payphones and Calling Cards from BT - Public payphones - payment prices". Payphones.bt.com. Retrieved 31 July 2012. ^ "R.I.P. Phonecards". BBC News. 30 May 2002. Retrieved 20 December 2018. ^ "payphones.bt.com". payphones.bt.com. 21 October 2011. Retrieved 25 April 2014. ^ Allen, Richard (28 May 2002). "BT scraps phonecards after slump". Evening Standard. Retrieved 20 December 2018. ^ "Section 2:Call Charges & Exchange Line Services Part 3:BT Postpaid (BT Chargecard, BT Odyssey, BT Adventure) - These products were withdrawn on 1st March 2018". www.bt.com. Retrieved 20 December 2018. ^ "International Phonecards - Excellent Rates | Post Office". www.postoffice.co.uk. Retrieved 20 December 2018. ^ Ojok, Paula (20 April 2015). "An end to Payphone Access Charges for helplines". Helplines Partnership. Retrieved 20 December 2018. ^ "BT Price List". Bt.com. Retrieved 25 April 2014. ^ "Payphones and Calling Cards from BT - Payphones". Archived from the original on 20 February 2014. Retrieved 21 December 2018. ^ Robertson, Patrick (2011). Robertson's Book of Firsts. Bloomsbury Publishing USA. ISBN 1608197387. ^ Newton, Harry (2006). Newton's Telecom Dictionary. Backbeat Books. p. 687. ISBN 1578203198. ^ Sinclair, Molly (14 December 1981). "Bell Pushes 25 Cents As Nationwide Pay-Phone Rate". Washington Post. ISSN 0190-8286. Retrieved 28 June 2018. ^ and, Andrew L. Yarrow. "Goodbye, Dime Call? ; 25-Cent Toll Sought in Connecticut". Retrieved 28 June 2018. ^ CHRISTIAN BERG (18 March 2001). "Pay phones reached their peak in "95 - Morning Call". Morning Call. Articles.mcall.com. Retrieved 10 April 2014. ^ Howard Yune (1 September 2012). "Pay phones: forgotten but not gone". Napavalleyregister.com. Retrieved 10 April 2014. ^ "As pay phones vanish, so does lifeline for many". USAToday. Retrieved 6 February 2017. ^ Universal Service Monitoring Report (PDF). 2016: Federal Communications Commission. p. 8. Retrieved 14 November 2017. ^ Bensinger, Greg (12 October 2011). "Era ends as Verizon drops most of its pay phones". The Wall Street Journal Market Watch. MarketWatch, Inc. Retrieved 23 January 2013. ^ "Complete Smart Payphones". Intellicall. Retrieved 31 July 2012. ^ "Telephone World - GTE / Automatic Electric Pay Telephones". Phworld.org. 20 December 2008. Retrieved 31 July 2012. Wikimedia Commons has media related to Payphone. Pay phones: Is That Still A Thing? in the San Diego Union-Tribune. PayPhoneBox Index of payphone numbers and photographs of payphones in unusual or famous places around the world. McPayphone Directory: Project to collect America's 1.3 million payphone numbers and numbers abroad.